During the 2015/2016 academic year, the Architectural Design program at Stanford University and the School of Architecture at Northeastern University collaborated on a year-long research studio called “Situated Work + Public Life.” The course investigated changes in how people work, how public life unfolds in both cities and suburbs and how the intersection between workplace and public life can be framed and mediated by new directions in workplace planning and design. Work and workplace topics included wellbeing, multigenerational shifts, spatial configurations, information flows, collaboration, and tools for work. Public life themes included public policy and land use, capital dynamics, infrastructure, density and scale, civic engagement, and tactical urbanism. Four site locations between Boston and San Francisco, analyzed in a series of study trips, provided a variety of contexts for applying the research and developing different scenarios. The studied belief that the workplace will continue to play a pivotal role in civil society and the global economy, despite trends in mobile work and automation, underpins the discussion about evolving the workplace as it relates to the public realm. Under investigation are the ways in which the workplace (urban or suburban) might more effectively serve both knowledge creation/exchange and public life—a mutually beneficial proposition to be rendered in the public/private interface. The research and projects presented in this publication employed different approaches to investigating the trajectories of work and place: data analysis, ethnographic studies, cross-disciplinary study, and research through design. The students’ work, taken as a whole, pointed to two key benefits sought by today’s knowledge workers: Flexibility and Work/Life Integration. While flexibility and work/ life integration have been well covered in journalism, the students’ projects compel a deeper inquiry into the commonly held assumptions of both. 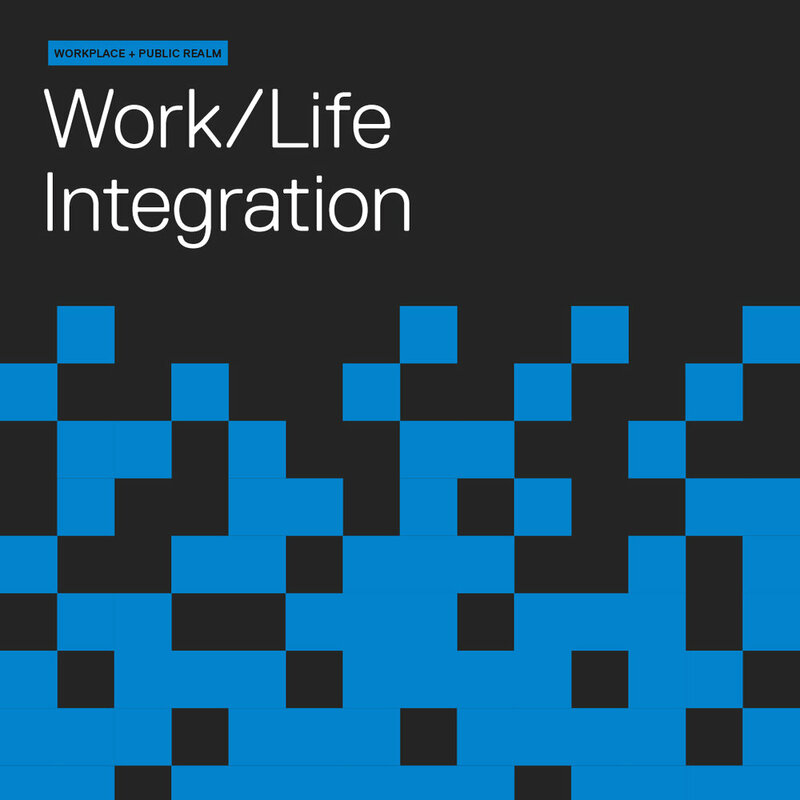 From an evolved understanding of the concepts of flexibility and work/life integration arises a third opportunity: the need for a new kind of platform to better support them—the Public Mesh, or a blurring of lines between workplace and public realm. The Public Mesh brings with it both great potential and complex challenges, as illustrated in students’ exploration of key factors influencing such a merge: Jurisdictional Dynamics, Territoriality & Boundaries, and Security.